LUX is a maker of a few different products. They make mechanical, digital and programmable thermostats. They also have a line of timers, grab bars for showers, and range (cook top) parts. It may seem like an odd assortment of products, but they are probably most widely known for their line of thermostats. And, it is quite the nice line up. 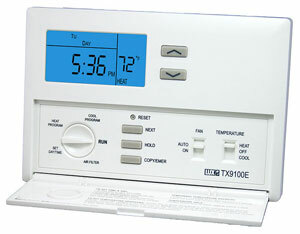 In addition the the manual thermostats, they have nine different models of digital thermostats. Those are the ones we’re interested in as the ability to program a heating/cooling schedule can save quite a bit of energy and money. In fact, these thermostats can pay for themselves in just a few months. For the giveaway, we have a TX9100E. It is a 7 day programmable thermostat which means you can have a different program every day of the week. It works with up to two stage heating systems and single stage cooling systems. It has a filter monitor to remind you to change your furnace filter. I also has a swing setting. Adjusting the swing setting allows you to adjust the allowable temperature range. If you set your heat to 71F, by default most thermostats will kick in once the temperature hits 70F and will turn off around 72F. The swing setting allows you to let the temperature drop to 69 or 68F before the furnace kicks in, and it will stop at 73-74F. Increasing the swing reduces short cycling of the furnace which increases its life and also increases efficiency. This is a great feature for a lot of people out there that have over sized furnaces (unfortunately a common issue).